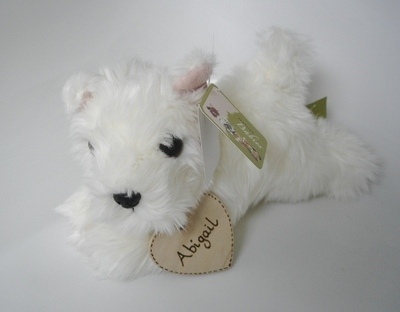 This westie puppy dog soft toy is approximately 20cm and is an extremely cute and great quality soft toy by Aurora. The puppy is so soft! It will have a wooden tag added to it with your message and this will be tied to the puppy with ivory ribbon. The choice of tag shape is: heart, rectangle, circle or star. "Thank you for being our page boy"
We can put a "love from (name)" message on the rear of the tag if you wish. The wording is added by pyrography.